The Smoke Wagon Blues Band from Hamilton, Ontario, has been winning fans over since 1996. With 13 tracks of great new music, Cigar Store, is sure to become a fan favorite, and then some. Cigar Store sports some really fine playing, including songs like “Must’ve Read It Wrong.” The combination of Corey Luck on the harp, Gordon Aeichele on sax and Nick Succi jamming hot licks on the piano is a mere taste of what other charms this winning album has to offer. With a jazzy piano intro courtesy of Nick Succi, “Directly Under Her Thumb” will see listeners dancing up a storm. Though the shortest track on the album, this is sure to be a favorite. The title track is the polar opposite of “Directly Under Her Thumb.” Beginning in a ballad-like style, “Cigar Store” slowly builds from a narrative that explodes right around the halfway point of the song with every band member letting go, their unique individual talents fully on display. For those who gravitate more towards a down and dirty in your face attitude, along with a hard-hitting gut wrenching beat, “White Mule” provides a darker side to the album. For a funky feel, “Mean Old Lady” gets our vote. With a groovy horn section, this is one number that James Brown, George Clinton or Chuck Brown would enjoy. “I Can’t Change,” is the love song on the album. The song tells the tale of how so many men try to change their bad habits or same old same old ways to get the woman they are seeking to win over. It’s an honest number that will tug at the heartstrings. 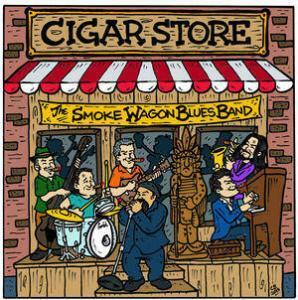 The Smoke Wagon Blues Band has been winning fans over everywhere they perform. With Cigar Store now available, they will win over even more. This is a must have album for all blues fans.